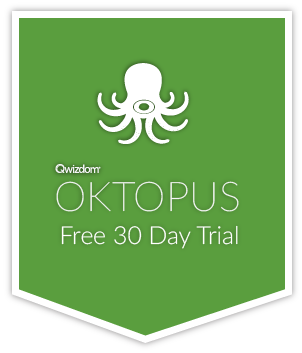 A new truly-4K performance enhanced version of OKTOPUS is now available to download! We’ve made our pen super-fast, even on 4K displays with limited spec hardware and integrated graphics. This should also make a difference to the pen speed for all our users, no matter what type of display or other hardware they are using. In order to achieve this, we have unfortunately been required to make a major change to our software surrounding Glass Mode. For more information about how this will affect your OKTOPUS usage, please see the Glass Mode section of our user guide. However, do not fear, we will be bringing back Glass Mode the way you have been using it with another update in the very near future. In other really exciting news, OKTOPUS now has brand new interactive activities. Find the link for these in your toolset selector. They support dual and quad screen layout, and each section can run its own activity! And for tabletop users, there is even better news – they can be rotated for up to 4 users around your screen! Change – NEW “Simple Glass Mode”. A new way of capturing your desktop and other applications has been introduced to result in a significant improvement in pen speed, especially on 4K/UHD screens. The current Glass Mode will be reintroduced with a future update. Click here for further information. New – Interactive Activities. Find them in your toolset selector. Supports split screen and quad screen. Run multiple activities independently. Supports rotation for tabletop flatpanels. Please note: Not available to all suppliers of OKTOPUS. Please contact us if you would like to find out more.